This spectacular rattan style bed is a delightful recreation of traditional French designs embodied by our Provencale range. The combination of sophisticated rattan and intricate carved details add a refined ambience to any room. 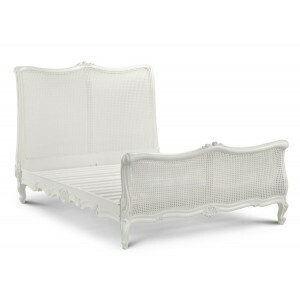 With an antique white painted finish, this bed could be matched with our French style range or any coloured French style furniture. Note: This item may require assembly upon delivery at an additional charge, please enquire with our sales team.